When my firstborn was a toddler, I traveled with her to Nashville, London, Paris, and León and Guanajuato, Mexico. We also road tripped back and forth between Minnesota and Wisconsin many times. She was an excellent little traveler, and I was feeling pretty smug about it. See? I thought. 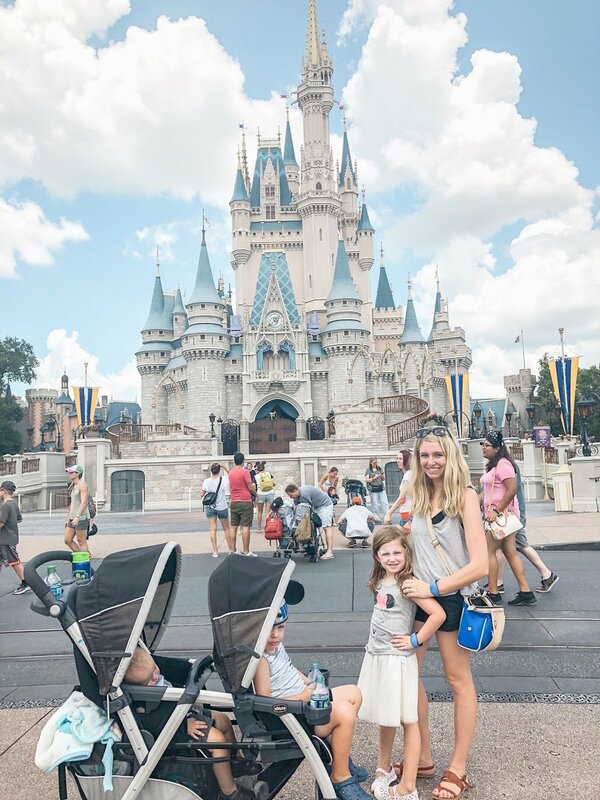 People don’t have to give up travel just because they have kids! Look at us, taking a toddler to all of these different destinations! What I didn’t realize is that traveling with one toddler, often with multiple adults to help out, is VERY different than traveling with two or even three kids with a toddler at the tail end. Yikes. I also didn’t take into consideration that toddlers, like all human beings, have different dispositions. Some are more amenable to being contained to carrier or stroller. Some will happily sit and color at a restaurant while the parents eat or talk. Some will hold your hand, sleep great despite time changes (my first born), and eat whatever food you give them. Other toddlers, who have received the exact same upbringing, parenting, and discipline will scream and go boneless if you try to contain them in any way. They will grab anything within reach on the table at the restaurant and attempt to throw it on the floor. They will run away from you screech-laughing on a busy sidewalk, stay up until 11 pm because you’re at a hotel (even with no time change), and throw food, mash it into carpets, and generally make it look like a pack of wolves left a trail of carnage whenever they eat. Yes, friends. We have experienced everything on the toddler spectrum when traveling with our three kids. We had the exemplary well-behaved toddler, the clingy toddler who hated crowds and noises, and now the destructive toddler who just wants to have a good time. I think if we’re not going to let toddlers stop us from doing things, we might as well at least be prepared and learn from each other. 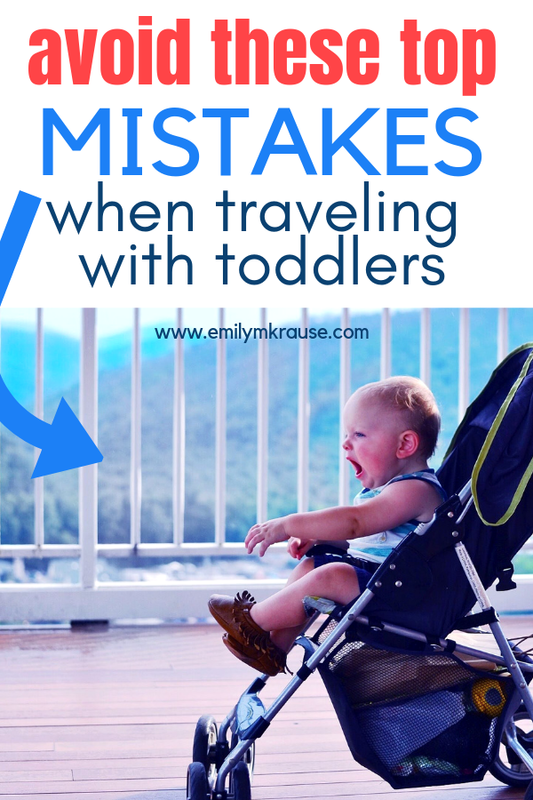 The following list are all mistakes I’ve made and learned from when traveling with toddlers. 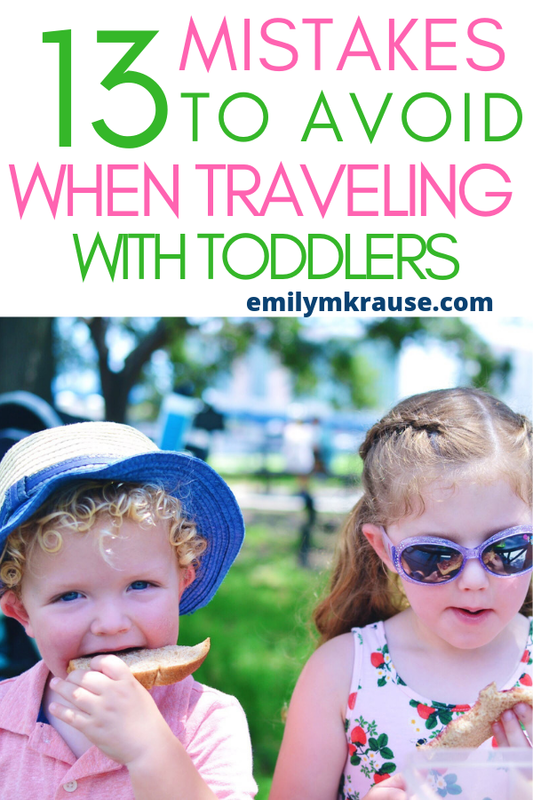 Maybe you can take something away from this list and make your next trip with toddlers a bit more enjoyable. Maybe you’re too optimistic about what you can squeeze into the day, or you’re looking forward to how relaxing a hotel stay is going to be. Stop. Lower your expectations. Nope, that’s not enough. Lower them again. There, that’s better. I would say the all time biggest mistake I have made when traveling, whether it’s with kids or without, is setting my expectations too high. When something doesn’t live up to what I’ve built it up to be in my head, I feel disappointed and don’t enjoy the trip as much. When I’m realistic about what might go wrong, and make up my mind to enjoy it anyway, that’s a much better recipe for making memories. Trust me, I’m usually the person who books the cheapest plane ticket no matter what the schedule is or how many layovers there are. However, if you are flying with a toddler, it is essential to be more strategic with your air travel. I’ve found that no matter the squirrelly-ness (probably not a word) or energy level of my toddler, it just tends to go better when they turn off the cabin lights and you can try to snuggle them to sleep. I know many toddlers will still fight this, and there are times it has taken an hour or more of tickling their arm or singing soft lullabies in their ear to get them to relax and sleep, but in my opinion it’s better than trying to entertain them for 4 hours or more when all they want to do is explore the aircraft. This is a case, though, where you must know thy toddler. The night flight won’t work best for everyone, so do what works best for you. Maybe first thing in the morning when they are in a good mood? For some reason, I almost always forget to add a sippy cup or bottle to the packing list, which causes a disproportionate amount of headaches during the trip. Even if your toddler can drink out of a regular cup at home, do you really want to risk spills in hotels, nice restaurants, or public places where it would be a hassle to clean up? Also, I don’t want to spend the entirety of my trip sharing my drink care-ful-ly with my one-year-old. Everyone will be happier if you just bring the kid’s favorite cup with a lid. Listen, I get it. All of the experts are telling us our kids are going to grow a third arm or something if we let them even see a screen before age 30. We definitely keep close tabs on screen time at home. But if ever there is a time to relax your standards a teeny bit, it might be on a plane or in a car with kids. Even more so in a plane, because you want to be respectful and mindful of other paying passengers, where as in a car the kid is only bother you if they scream the entire time. I usually download nursery rhymes to my phone or let them play with the screen on the back of the airplane seat, and it buys me a few minutes at least. If your toddler is very well-behaved and is happy to be put in a carrier or will hold your hand, then by all means, ignore this tip. Sometimes you just need a break from entertaining them, though, and in this case it’s super helpful to strap them in a stroller and put some snacks on their tray. Even my energetic toddler will relax in the stroller for a little bit as long as it’s moving, and snacks certainly help. (Just make sure to have wipes handy). Yes, I already know people are going to comment that a carrier works better for them, and that carriers are so much less bulky. I totally get that, and as a minimalist at heart I wish it worked for us. But having a stroller where I can physically get some space from the kid (very important for my introvert heart) that also doubles as extra storage space for snacks, water bottles, diaper bags, or whatever other accoutrements kids tend to shed throughout the day has been a life saver in so many situations. I even take my stroller through the airport and gate check it before getting on a flight. I’ve also never had an issue taking the stroller on trolley tours, in museums, etc. I have been known to be a bit over-optimistic with my travel plans, and try to cram in way too many activities into a day. Part of this comes with being a travel writer who only has a limited amount of time at a destination that I need to write about. I want to make sure to do the place justice and experience as much of it as I can in order to write a helpful or insightful article. Regardless, I’ve tried to skip my child’s nap time, thinking they would be go-with-the-flow and just go to bed early. That may have worked when I had one easygoing toddler, but it certainly hasn’t worked for kids number 2 and 3. There have been one too many meltdowns in museums, water taxis, and boardwalks. We now plan to get the kids back for lunch and nap, then stay up a little later to make the most of our time in a city. A nap or even quiet time will make your child much more agreeable. Remember that travel means new places, sounds, sights, and stimuli which is exhausting for a kid. They really need that time in a quiet room to decompress before you push them to do more. Listen, I get it. Toddlers come with A LOT of gear. Carseats, strollers, carriers, pack & plays, diapers, wipes, extra outfits, toys, books, sound machines, and snacks. It is really easy to over-do it and have your bags brimming with supplies for your toddler. Sometimes you pack so much you can’t even get to the things you need to make travel go smoothly. That’s obviously counter-productive, and you need to streamline. Try to stay somewhere that provides a pack & play or rent one when you arrive. Pack enough diapers for the en route portion of your trip, then buy a small pack when you arrive. Limit toys and books to one or two favorites. My kids never end up playing with the things we bring from home anyway. Get a sound machine app on one of your devices (or use this really lightweight machine that we bring every time). Ok, this is kind of a chicken-and-egg argument, but hear me out. Yes, traveling with a toddler is stressful. There’s absolutely no doubt about that. But in my experience, toddlers pick up on our emotions. If we are feeling anxious or stressed out about something, they know. For some toddlers, this will have the effect of making them more anxious. For others, they will sense weakness and take advantage, behaving worse than they would otherwise. So basically, I go into travel with toddlers with this attitude: This is going to be the absolute worst, but who cares? It won’t last forever, and it will make for a hilarious story later. This way, I’m more inclined to laugh than cry if my toddler’s diaper leaks or they crush a raspberry into the carpet. I’m more inclined to be patient than frustrated. I’m more laid back and go-with-the-flow. It doesn’t magically make your toddler behave perfectly, but it does put the whole family at ease. There’s nothing worse than a hangry toddler. Nothing. I always have apple slices, dry cereal, a granola bar, and emergency lollipops in my purse when I travel with a toddler. Always. Also, some of those snacks are for me. I could share horror story upon horror story of not being able to relax on a trip because I was worried about my child falling down the stairs or squeezing through the bars on the balcony. I’ve stayed at places that were far too fancy for my child and I had to follow them the entire trip picking up every crumb. I’ve stayed at places with breakable items everywhere within my child’s reach. So what makes a place kid-friendly, and how do you find such a place? In my opinion, toddler-friendly accommodations means there are either no stairs or there are baby gates for the stairs. They provide a crib or pack & play. There are no breakables (or the breakables are up high). 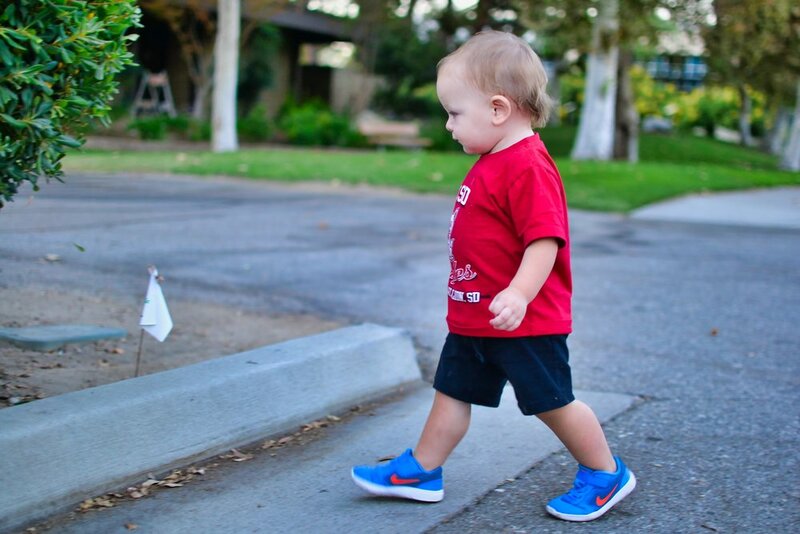 There is a place for kids to run around, whether that’s a yard at an Airbnb or a kid’s area at a hotel. People won’t roll their eyes when you toddler is being, well, a toddler. Bonus points if there are toddler-specific amenities and activities. I check the “family friendly” box when searching for an Airbnb, or just look on Kid & Coe, a home rental site geared toward families! If you’re staying at a hotel, do your research, read reviews, or call ahead of time to find out if your child will be welcome or a nuisance. It is worth the extra time to make sure your accommodation is suitable for your toddler, because if you can’t even relax at your “home base” during the trip, your time there will be absolutely miserable. Trust me on this one. Again, disregard this tip if your toddler is exceptionally well-behaved in restaurant settings. Also, send me some tips. K thanks. We were able to go to restaurants when our oldest was a toddler. She had a happy disposition and there were two of us to one of her. Now with three kids ages 1, 3, and 5, going to a restaurant can feel like torture. (Just imagine me crawling under a table picking up mushy crumbs, and picture all of the plates, cups, and silverware squished on one end of the table so the toddler can’t reach it). Just do yourself a favor and go to more casual and relaxed restaurants. Bonus if they have outdoor seating. Don’t get me wrong. I don’t think we should stop living life just because we have small children. They need to learn how to behave in public. BUT consider that toddlers are maybe still in the process of learning. Think of casual restaurants as training and practice. When they’re a little older (age 4 or 5), then you can start going to nice quiet restaurants again. Having just advised you to avoid fancy restaurants, I’m also going to encourage you to continue going to museums and cultural events with kids. Often, kids under the age of 3 are free. Once your kids are all older, some places will be a lot more expensive. Try to take advantage now when you’re paying nothing for your little ones. Also ask at the front desk if they have any programs or activities for little ones. Some places have scavenger hunts, audio tours for kids, or activity rooms. I’ll say this in almost every blog post, but I can’t encourage it enough. DO TROLLEY TOURS WITH YOUR KIDS. Every toddler I’ve had, even the craziest one, has loved looking out the window and has actually sat still long enough for me to listen to the driver talk about the city’s history. 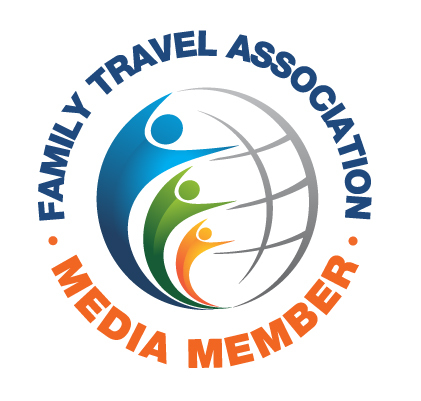 I’ve heard a lot of families say they’re not going to travel at all until their kids are older. Trust me, I really feel that. I understand that with every fiber of my exhausted mom being. It just sounds so much easier to stay home where everything is familiar and doesn’t cost a ton of money just to chase your kid around frantically. But travel doesn’t have to mean expensive vacations around the world or pricey resorts far from home. Travel can mean exploring your city or taking day trips to nearby cities. It can mean visiting state and national parks. The earlier you start traveling with your kids, no matter how near to home it is, the better they will behave when they’re preschool age, kindergarten age, elementary school age, and beyond. I hope you were able to learn from my mistakes! Now it’s time to go out and make your own. The best way to learn is by making mistakes after all…plus they make the best stories.